I know it's a bit early for Halloween, but I couldn't resist baking up a fun, festive treat. You can blame it on the Halloween candy already popping up on grocery store shelves. I can never control myself when all the seasonal baking items start making an appearance. I know it's still hot outside, but fall is coming and I can't wait to get started on all my favorite fall recipes. The other day when I was shopping at Walmart I spotted these White Chocolate Candy Corn M&M's in the candy isle. Candy corn flavored m&ms didn't sound very appealing eaten alone, but using them in some sort of sweet treat was a fabulous idea. My first thought was to make some sort of cookie, but what kind? I remembered I had several bag of white chocolate chips stashed in the freezer. 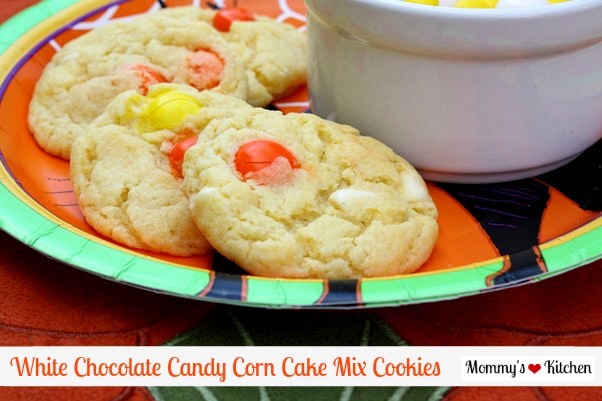 I pulled out my favorite cake mix cookie recipe, and added white chocolate chips, cream cheese and these festive candy corn m&ms. The results were delicious!!!!! Everyone in my house loved them. Combine butter, egg, vanilla, and cream cheese in a large bowl. Mix together thoroughly. I used my kitchen aid stand mixer with the paddle attachment. Add the cake mix half at a time and mixing until well combined; batter will be thick. 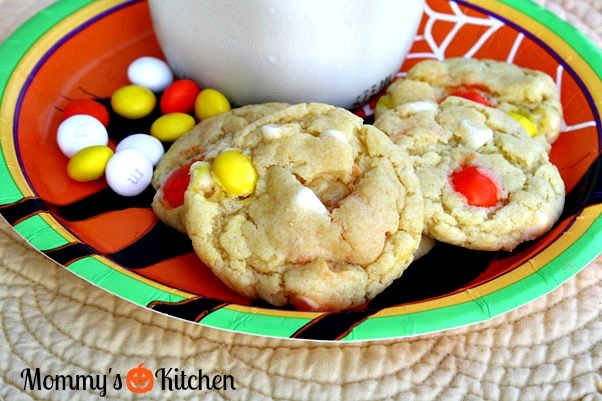 Stir in white chocolate chips and m&m candies by hand. Refrigerate dough for 30 minutes and then roll into 1 inch balls. I used my cookie scoop and then rolled into balls. Preheat oven to 350 degrees. Place cookie dough balls 2 inches apart on un greased baking sheet or use parchment paper. Bake for 10 minutes and do not let the cookies brown. You want them to bake just until they are set and slightly golden on the bottom. Let cookie cool on baking sheet for 20 minutes before removing to a wire rack to cool completely. Store cookies in a air tight container or cookie jar. Cookie Bar Version: Spread the cookie dough into a greased 9×13 baking dish; batter will be thick. Bake at 350 degrees for 20-30 minutes or until edges are golden and middle looks set (test with a toothpick). 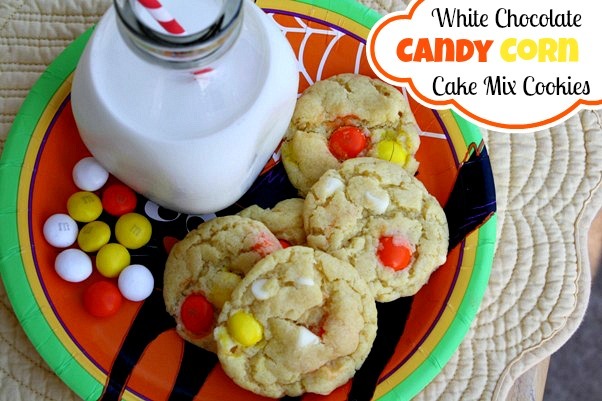 These cookies are perfect for Halloween, so grab a few bags of these m&ms as soon you see them. I only picked up one bag because I wasn't sure how they tasted, but I plan on getting more on my next grocery trip. How about a bar cookie, Tina? You can spread the mixture into lightly greased 9x13 inch baking dish. Bake the bar cookies for 20 - 25 minutes. What size of cookie scoop did you use? I was unaware that cookie scoops came in different sizes. It was not listed, but I measured it and it is 1 1/2 inches. Looks delicious! I love candy corn!! These look so good! I think I'll make these for the grand-kids, tomorrow! Thanks for sharing your wonderful recipes! Last year Santa brought me a brand new bright red kitchenaid. I used it tonight for the first time (LOVED IT) to mix these cookies! They are chilling right now and will be in the oven in about an hour.